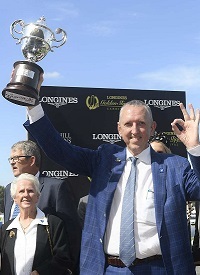 Amid all the hype and excitement about Winx’s glittering career to date, her part-owner Peter Tighe says he never takes her for granted and wants to savour every moment. It’s a rare thing, Tighe said, to be involved with a horse of her stature so he never tires of reflecting on her deeds and looking forward to the next achievement. That next high is scheduled for Saturday’s Group 1 $4m Longines Queen Elizabeth Stakes (2000m) at Royal Randwick. “She’s such a great champion, whether it’s horse racing or cricket you never get sick of talking about the achievements of great sports people or animals,’’ Tighe said. Winx is of course aiming to match Black Caviar’s record winning streak of 25 wins and move further into unchartered territory with 18 Group 1 victories. After drawing the outside in the 10 horse field, Winx eased slightly in the TAB market to $1.18 but Tighe said the draw doesn’t matter so much to the mare. Doncaster Mile winner Happy Clapper (gate 9) and runner-up Comin’ Through (gate 2) are backing up from Day 1 of The Championships and the race has a real international flavour with Irish galloper Success Days, French bred Gailo Chop and former Japanese galloper Ambitious among the mare’s rivals. Winx worked on Tuesday morning over 1200m at Rosehill, finishing off her last 400m in similar style to her major gallop prior to the Group 1 George Ryder Stakes (1500m) on March 24. Tighe said trainer Chris Waller’s management of the rising seven-year-old is no small part of why she’s likely to be back in the spring. “A horse’s career is usually a lot shorter than hers, especially at the top of their game. We’ve been at that level for quite a while,’’ he said. A fourth Cox Plate is high on the agenda for Team Winx and there’s every chance the mare could be an added attraction for Everest Day in the Group 3 Craven Plate (2000m) as her final lead up run before heading to Melbourne. As for Saturday’s history making attempt, Tighe urged race fans to make the trip to Randwick to see Winx in the flesh. “It’s an opportunity for horse lovers and non-horse lovers to come and see a good horse. If you’re ever going to come this is the time,’’ he said.